Yea! 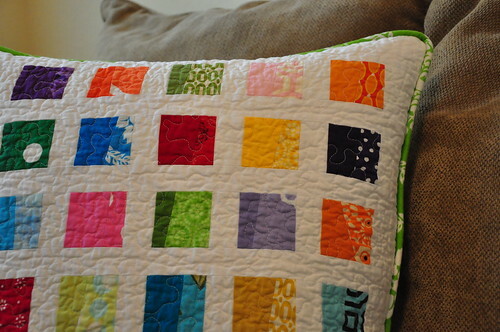 I washed my quilted swatch with a Shout Color Catcher and nothing bled, so here's my pillow! It was also a good place to audition fabrics for my quilt. One fabric looked a lot like batik to me and I had decided I probably wouldn't use it in the quilt. I have nothing against batik, but I wouldn't mix batik with other printed fabrics. But washed, it's not so bad (top photo, second block from the left in the third row) and I'll probably go ahead and use it. When Shea saw the quilted swatch, she thought it was going to be another placemat, so she was really disappointed when I told her it was a pillow. Elizabeth's Paintbox pattern calls for forty fabrics, but I only used 36 in the pillow. I have actually collected over 50 fabrics that I've matched to my Kona roll-ups, so I have plenty to make her a placemat to test the remaining fabrics. A simple button closure for the back. Oh, I almost forgot about my sewing machine woes yesterday. Long story short, I dropped one of the needle plate screws down into the machine. It disappeared. I unplugged everything and turned the heavy beast upside down, but nothing came out. I was afraid to continue sewing not knowing if that screw had lodged itself into a moving part, so I packed it up and drove into town to the store where I bought it. They had to completely dismantle it to find the screw, so I got to see my sewing machine's guts. She's got quite a motherboard in there! I felt like an idiot, but they were happy to help and didn't charge me anything to retrieve the screw, so all ended well. Note to self: when removing the needle plate to clean out the lint that's keeping your low bobbin alert laser from working, set the screws to the side, not on the machine! i'm glad none of the fabrics ran! 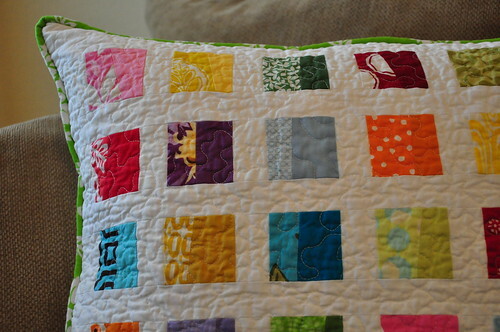 & the resulting pillow is super cute. 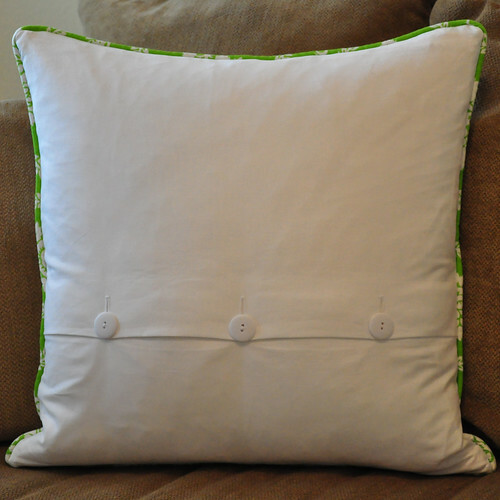 i have lots of pillows on my to-do list... you may have given me the push needed to get them done! 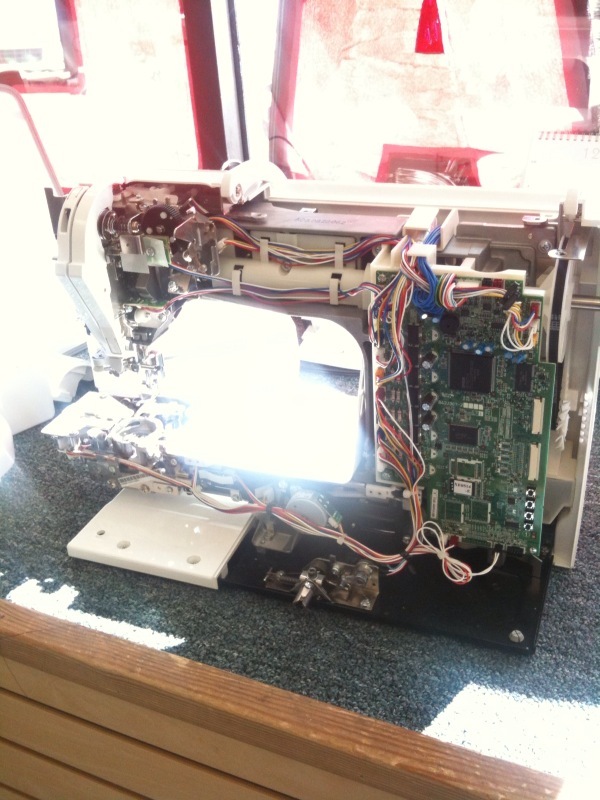 I love your pillow, but I also wanted to say that it is *so cool* to see the inside of your machine like that!! and that reminds me that I should open up my machine and clean out the lint! ohhh, I really really like your pillow! I came here via Oh, Fransson! and I'm so glad I did - you're blog and projects are great. I'm visiting from Oh, Fransson! as well and I am so enamored of your pillow that I may have to make one too. 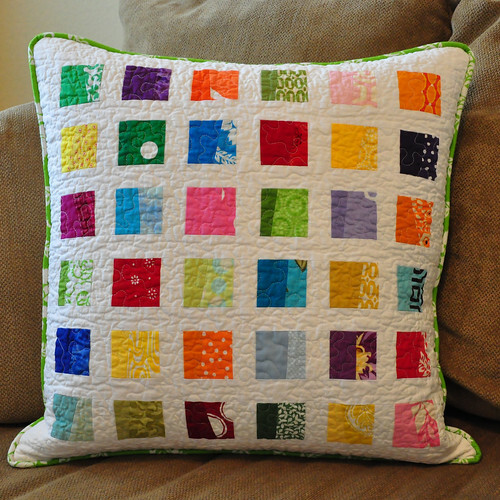 I've been too intimidated to try the paintbox quilt but a paintbox pillow might be just the thing! I found you via OhFransson. Your pillow is great!! What a good idea. Glad your sewing machine is okay. And this pic of your dismantled sewing machine reminds me of pics of bodies without skins & showing all the muscles beneath !